The 2019 Directors' Forum will be held at the Hilton Mississauga/Meadowvale. All participants are responsible for booking and paying for their own accommodations. Click for directions to the venue. It is not the responsibility of the DF to book accommodations for its guests. Conference delegates must make their own reservations directly with the hotel. 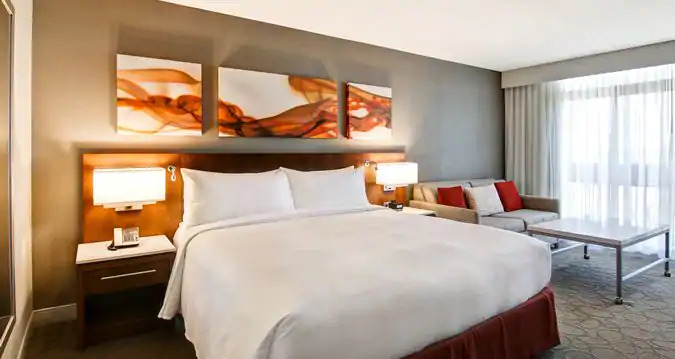 The deadline for the group rate of $155 per room, is September 10, 2019. Any delegates requiring a room after this date will pay the prevailing rate of the venue. It is a good idea to book as early as possible, as once the group block is full, the hotel's prevailing rate will apply. You can book by calling the reservation desk at: 1-905-821-1981 (make sure to tell them you are with the "Directors' Forum") or directly online. Please note that a municipal accommodation tax of 4% plus 13% HST will be added to the rate. In order to receive a full reimbursement of your room booking should you need to cancel, you must do so 48 hours prior to your arrival. If not, one room night plus tax will be charged to your credit card. You can cancel directly here. Check-in time is 3:00pm and check-out is at 12:00pm. A late check out fee of $25 per hour after 2pm will apply. The DF will provide space for delegates to store their luggage upon check-out. Parking is complimentary for all our delegates (the venue has waived the self-parking fee of $16/day). Valet parking is $20 per day. Complimentary high speed wireless internet is included in all meeting rooms, guest rooms and public areas. The venue includes business centre services, a fitness room, as well as a pool and waterslide. The venue is a smoke-free facility, and smoking is not permitted in any guestrooms, meeting rooms, public areas or food and beverage outlets. There is a café and dining facility in the hotel, along with a number of excellent places to dine within a short (walking or driving) distance from the venue. For delegates who are bringing along a guest, click here for a list of nearby attractions and things to do!